Then, a strange thing happened. i was sitting on the single window seat while my friends were on the other side windows with the longer seats/berth. As we were talking i had to yell across the seats in order to communicate in the loud background noise of the fast-running train. My friend unable to hear clearly, called me to come over to his seat to which i refused stating that experience says that the moment you get up from your seat in a sleeper compartment on a busy train, it will be immediately occupied by someone and you have to spend some energy telling how the seat is reserved.. lol. But as the train was slowing to an arriving station my friend convinced me that nothing of that sort would happen and i left my seat and come over to him. Not even a few words were exchanged and a person came and occupied my seat. Now, that was not a prediction but just common sense for a common man on a common train. i approached him and told him in Tamil that the seat was reserved to which he immediately apologized in English and also continued with a request to allow him to sit as there was no place to place a feet in the general compartment. He promised that he would get down at the next station. i was not amused nor happy nor compassionate but just felt it was okay if he was to get down after an hour or so. After talking for a while with my friends, i returned to sit on the opposite seat of this gentleman, who sported a trimmed beard and glasses. This seat also was our reserved seat. By now i had forgotten about our next night problem of having a waiting list train the next night that was the previous night to an important trek the day after, but i pulled out by bundle of print outs of plans and information on locations and their significance that i always carry with me. We were to reach early morning Mayiladuthurai, where Bogarnathji taught the preparation of Muppu (Siddha preparation for imortality) to his group of 557 disciples who were residing in Siddhar Kaadu (Forest of Siddhas) near Mayilaaduthurai. As i was reading through the plans, the person who had occupied my seat was looking into the other part of the page that was facing him and he asked where were we off to. I told him the details and our purpose, to which he smiled and said that it was poornima (full moon day) that day and that we should before the next noon visit the temple in Siddhar Kaadu as it was auspicious. He told me more details about the place and what is to be done and when i asked him how did he know about it, he proceeded to mention that his Guru was a living Siddha in Tiruvannamalai and he was instructed by his Guru sometime back to go and sleep overnight in this temple in Siddhar Kaadu and that he had regularly done it at that time, every poornima night. This temple is a powerful temple because it has multiple Jeeva Samadhis at one location itself over which the temple was built and sleeping overnight at such powerful places and that too on full moon days was something very significant. i was now internally starting to thank the Masters for this seat "coincidence" and continued to converse with him. He further looked at the printed sheets from my hand and struck a point on how best we should travel back from there to the next location. He further mentioned that it was not wise to take the next night train to the next location (the waiting list one) and that we should probably take a taxi from there and drive down to Madurai, getting opportunities to visit other important locations. A great relaxation came over me to know that the waiting list was actually a boon for us. Not just this, when he saw that we were heading also to Palani Hills, he said that he would give the contact number of friend of his there who could arrange accommodation for us. Since all these places were the first time for us to visit, it made me even more happy. He further talked to me about how he and his wife made a rare powder for allergies and that were effective with instantaneous effect. He mentioned that his guru had taught him this and were made out of rare herbs. He pulled out a packet from his pocket and asked me to taste a bit of it. i said i dont have any such problem but he asked me to taste it to ensure that this powder had a good taste too. He ate some of it himself and said he keeps it with him for his dust allergy. i tasted it and it had a sharp taste with a tinge of cinnamon. He asked me to keep the packet and i refused to which he insisted that he had enough for himself. i kept it. He took my number and gave his number and asked him to call for any assistance from anywhere during our travel if we needed his help. The train slowed and he got up for this was his station. Bidding us goodbye and thanking, to which we profusely thanked him for all his help, he mentioned his name as Ganesh and left, before leaving requesting that all these details that we carried with us be shared with him by mail. Turning to my friends, we all chatted merrily now since everything just fell in place and all our worries were wiped out, thanks to this gentleman, whom i strongly believe was the help from our dear loving Masters, who was dropped right in front of us and gave the right information at the right time and the time was he was us was perfect enough to share all the important details. He tipped us a lot of things about the trip and the love of the Holy Siddhas. Knowing that he is a reader of Siddhas, if you ever our reading this Mr. Ganesh, our love and gratitude to you. A good night sleep and the train reached early morning Mayiladuthurai, a small railway station. 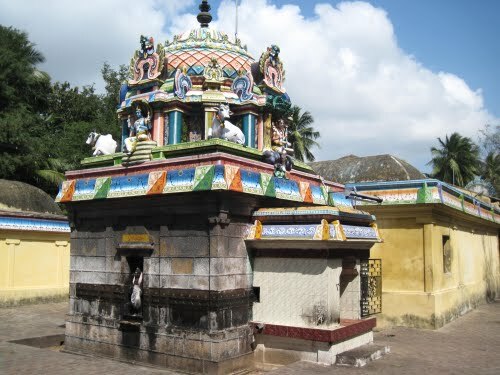 Legends say that due to a curse, Goddess Parvathi took birth as peacock in Mayuram and worshipped Lord Shiva in his form of Mayuranathar. Mayuram means peacock in Sanskrit and it was later translated as Mayiladuthurai in Tamil language. It was also known as Mayavaram. We knew by now that this was a small town or village and it was difficult enough to hunt for hotels, so we helped ourselves at the waiting room, including our bath :) It did save a lot of time. Moving out of the station, asking for Siddhar Kaadu, we moved through narrow passages of low-lying huts and drooping one-room homes. We were hungry and found a small hotel. Very delicious soft idlis made our great breakfast a very very low cost. We moved further and had coffee at a roadside shop and asked for our destination location. They asked us to climb the railway overbridge and on the other side walk a few meters and ask anyone. Here, no other language except Tamil. The person asked where we were from and on telling him, he turned to other villagers around the shop and said in Tamil, "Look where all people come from and we being here, we don't visit." This was true, we found in all travels that the local people knew very less or sometimes didn't even know that Jeeva Samadhis exist in that location. But some people i have always found to have "more that normal" information about that particular Siddha or Samadhi, like the one i have mentioned in this visit. We climbed the stairs to the long overbridge and reached the other side. Upon walking for another 10-15 minutes we finally were guided to a temple. According to the book Mayiladuthurai Mahaangal (Saints of Mayiladuthurai), several saints lived and attained their final peace (samadhi) in and around Mayiladuthurai. Another most important thing that pulled us to this location was the multiple Jeeva Samadhis at one place. This place is a testimony to the astounding feat of Siddhas. 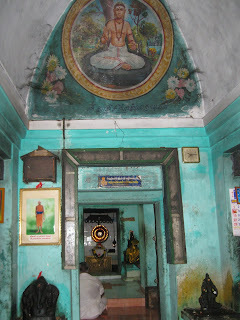 Here, the Guru, SriKazhi Sitrambala Naadigal, along with his 63 disciples entered into Jeeva Samadhi and all the 63 idols are symbolically added around the back of the temple. 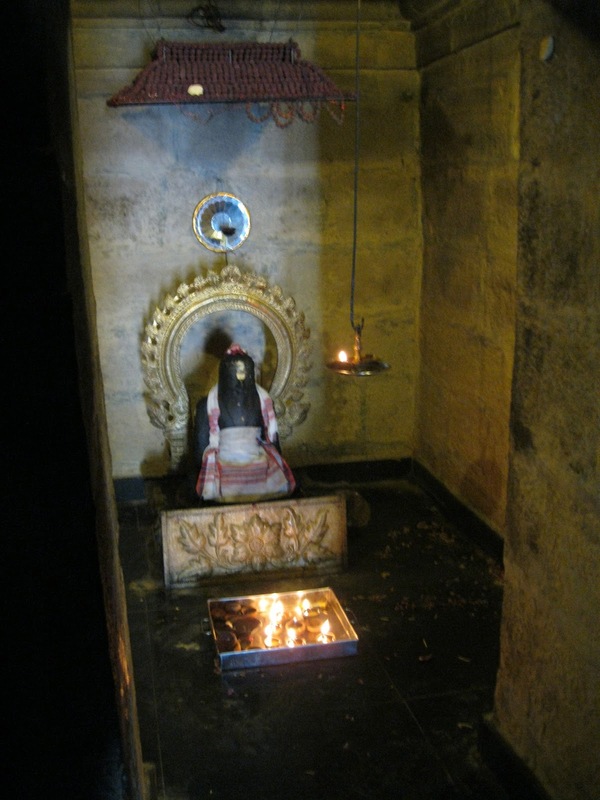 The Guru's Jeeva Samadhi is in the center which acts as the sanctum of the temple. We threw our bags and rushed into the temple and i was delighted to have the first glimpse of the Shivalinga under which was the Samadhi of a Siddha. We meditated there. When we came out the priest took us around demonstrating the idols and information about them and finally showed us may idols lined up very close to each other. He revealed that they were all Jeeva Samadhis of Siddhas. He was very happy to show us things and explain in Tamil, but i was having a tough time understanding it clearly and also translating it to my friends. Even if my translations were not accurate they were helpless and had no other option.